As their 2014 season finally came to a listless halt five months ago, the New Orleans Saints walked off the field to the tune of a 7-9 record, cutting a collective disillusioned figure as they traipsed towards the locker room one last time. A season that began full of playoff and championship aspirations quickly spiraled out of control due to a myriad of reasons. Compounding their frustrations was the fact that the NFC South was a complete mess, yet the Saints still could not emerge from the muck. A lopsided defeat to Carolina and two difficult losses to the Atlanta Falcons left New Orleans right where they deserved to be. Third place. No postseason. Plenty of negativity. As time has passed, the Saints have begun the healing process. An offseason buoyed by diligent personnel moves, front office adjustments and a good-looking draft class have fans of the black and gold trending back towards a state of optimism. Why not the Saints? The annual unpredictable race for NFC South glory should have just as good a chance to pass through New Orleans as it does Charlotte or Atlanta (maybe next year, Tampa). Second-year wideout Brandin Cooks has already completed a healing process of his own. Cooks was one of a handful of key players to land on season-ending injured reserve in 2014. He got his career off to a quick start, snatching 7 passes for 77 yards and a touchdown on the road against the Falcons in week 1. He continued to see regular targets as the season progressed, and had the best game of his rookie season as the Saints thumped Green Bay on a Sunday night in October, catching 6 balls for 94 yards and a touchdown while adding another score on the ground. 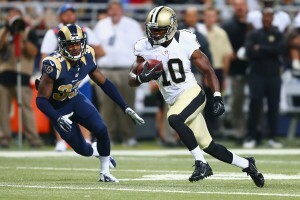 Brandin Cooks heads for the end zone against St. Louis. Two weeks later, Cooks followed that performance up with a 6 catch-90 yard-1 touchdown outing against San Francisco. Just when it seemed the native Californian was on the cusp of grasping consistency and legitimate playmaker status, he sustained a hand injury the following week against the Bengals. Surgery would follow, and the 21-year-old saw his rookie season come to an abrupt end as his teammates continued to sputter towards a disappointing finish. Enter 2015 OTAs, and Cooks is feeling fresh as ever. The man the Saints moved up to take in last year's first round is healthy now, and participating fully in offseason activities. Cooks even spent time back in California with quarterback Drew Brees. The pair worked on their chemistry and timing just as they did a year ago before Cooks had ever played an NFL snap. With the injury behind him, Brees knows Cooks is ready and able to re-emerge as a bona fide playmaker. New Orleans needs that spark in their offense, especially after shipping their dynamic tight end dynamo Jimmy Graham to Seattle, while vertical threat Kenny Stills was traded to Miami. The Saints will value Cooks' playmaking skill set and versatility now more than ever. "The more time on task we have together, the more we can build that relationship and I know this about him, he already came back better than he was before and I think just mentally tougher, stronger," said Brees of Cooks. "Ending the season with an injury, certainly not the way you want to go out, especially for a guy who is used to being durable and tough and playing through anything. That was just one of those unfortunate deals but I know he has been chomping at the bit now for a while now, so just getting back to work and watching his attention to detail and his work ethic... He's everything you want in a teammate. His makeup, and then just his physical ability. I mean he's got all kinds of talent. " Marques Colston, wildcard tight end Josh Hill and Cooks will likely be Brees' top 3 targets in no particular order. Colston will remain the safe hands capable of making the tough catches for the hardest-earned yards, while Hill has skills that give coach Sean Payton and his staff the belief that the third-year man can help fill Graham's shoes. C.J. Spiller should chip in to the passing game out of the backfield on plays designed to get him in space with Mark Ingram handling the brunt of the groundwork. Cooks, however, could be the straw that stirs the drink. Cooks' 2014 pre-injury usage evoked memories of another rookie eight years prior. Payton and Brees fed Reggie Bush the ball in a variety of ways in 2006. Out of the backfield, in the slot, flexed out wide, motioning across the formation, direct snaps, return game, you name it. Cooks, has the skills and the ability to be used in that same 'satellite' manner. However, he also has the nous of a natural pass-catcher as he showed when he led the NCAA in receiving yards and touchdowns as a junior at Oregon State in 2013. At 5-10 and 189, Cooks may not be built in the Calvin Johnson or Dez Bryant mold, but his speed, tackle-breaking ability and open-field exuberance give the Saints a dangerous weapon. 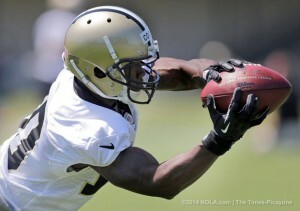 Brandin Cooks catches a ball in this June 2014 practice. It's no coincidence that Cooks has gone on to form a close relationship with Pittsburgh Steelers ace wideout Antonio Brown. The 26-year-old, who led the NFL in receiving a season ago, cuts a similar figure to Cooks at 5-10 and 186. Brown is used as a receiver, a runner and a return man in the Steelers' offense. When Mike Wallace left for Miami in 2013, Brown stepped up and became the guy without hesitation. Over the last two seasons he has caught 239 balls for 3,197 yards and 21 touchdowns. The table in New Orleans is now set up for Cooks to do the same, and the youngster can lean on his buddy from the Steel City in an effort to pick up some pointers as he enters year two. "He gives a lot of feedback," Cooks said of his phone and text conversations with Brown. "He doesn't send back one-word answers or a short message. If I got a question, he goes into depth and answers those questions for me." Cooks has the mental part down. This was evidenced by his ability to line up anywhere across the formation and get to where he needed to be to receive the ball. Due to Oregon State's mid-June graduation, Cooks wasn't even able to fully immerse himself in the Saints' scheme until after OTAs, but that did not stunt his learning curve at all. The physical part comes next, but that goes hand-in-hand with growing and maturing into a playmaker. For those who have questions about Cooks, his ability to produce and stay healthy, then the 2015 season will give the rising sophomore the platform he needs to respond to those queries. The fact of the matter is the volume will be there. The targets will be there. The Saints have talked up becoming more physical and discussed placing an added emphasis on the run game in the past, but we know that in crunch time, the Payton/Brees offensive brain trust won't hesitate to take to the air. Spiller's presence should allow Cooks to play a more natural receiver's role going forward, but he'll still get his high-percentage looks and designed plays in optimal situations. Cooks averaged a hair over 6 targets a game as a rookie, and with the likes of Graham, Stills and Pierre Thomas out of the picture, that number should skyrocket in 2015. Furthermore, Cooks should see his snap count in base sets shoot up as well with Stills out of town. He'll likely kick inside to the slot in three-wide sets, but should be a staple on the perimeter in two-wide alignments. From a fantasy standpoint, Cooks may have been somewhat overvalued a year ago based on pure talent and hype. Entering 2015 drafts, he may actually be undervalued to a degree. Per Fantasy Football Calculator, Cooks' 2014 ADP was in the early seventh round. With concerns over whether Brees' best days are behind him, a more run-oriented approach and/or his ability to stay healthy, Cooks' 2015 ADP should not move too drastically one way or the other. However, a healthy Cooks promises to return great value at the receiver position once the household names come off the board. While Marques Colston appears as the Saints' number 1 wideout almost by proxy, Cooks has a chance to produce at or near that level in 2015. Cooks is a different kind of playmaker from the physically-imposing Graham, but he can be just as special. As Graham would likely acknowledge, there's no better place for a young playmaker to develop into a man, or, the man than in New Orleans.